I'm a huge SHMUP fan, specifically Raiden II is my all time favorite. I've been a fan of the series and have purchased every iteration I can think of - from the officially numbered games to the Fighters and Aces spin-offs too. 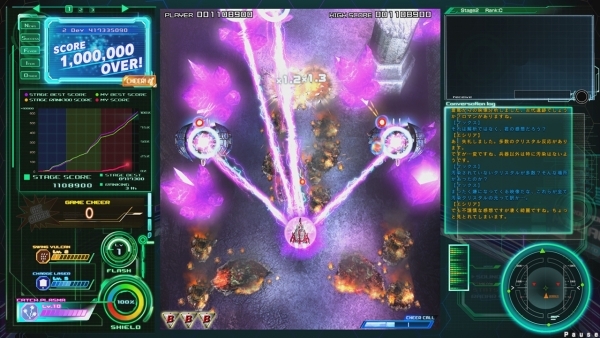 Raiden V is the first totally new game in the series in almost 10 years. It's also what might be the biggest departure I've seen. First the good things - the game's presentation is a huge step up. 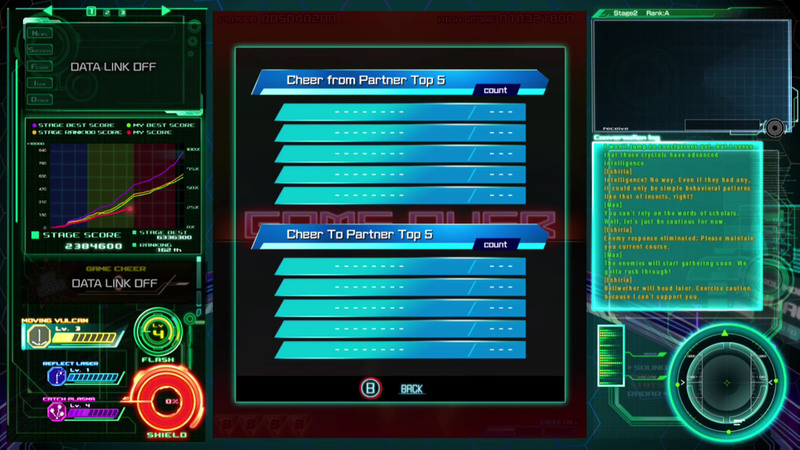 It integrates real time score tracking and stats utilizing the sidebars of what's typically just a static marquee. You'll be able to see if you are keeping pace with your previous high scores or the global ones at anytime. The in in-game transitions and scenes between levels are much more cinematic, the game never takes you out of flight. All of the expected goodies are here too for combat - three weapon types, three ships, and a variety of modifiers for them. There's also a fully voice story that plays out DURING actual gameplay. A captain and his assistant constantly feed lines of dialog that end up being a pretty big distraction, especially after they berate you for not killing enough enemies. All of that can be read (somehow) in a box below in case you missed something (you didn't) critical to the story during gameplay. The biggest change to Raiden V is there lack of two player co-op mode, instead the game takes on a cooperative play that reminds me a bit of Journey in some sense, but in reality it's closer to a Facebook "like" based on certain in game events. Kill counts, medal pick ups, score thresholds, and several other actions will trigger an on screen banner letting you know of this minor achievement - then this is blasted out to everyone else playing at the same time and told of your small victory. They can quickly tap the Y button giving you a "Cheer;" powering up a gauge which you can use to unleash a special attack. Obviously, you can do the same by keeping an eye on the top left corner of the game, cheering on your fellow pilots. It's an interesting mechanic, and seeing cheers pile up through any extended session is pretty cool. But the reality is, it's pretty gimmicky. I'd almost like to see this somehow working with Twitch streaming, allowing people to watch you regardless of medium and send you 'power-ups.' Sadly this mode of play does not make up for the lack of a true co-op mode in a game that's been about dual play for years and year. The biggest problem with this mode...for a niche genre like this there's never a lot of people playing, so the crowd can get quite quiet. 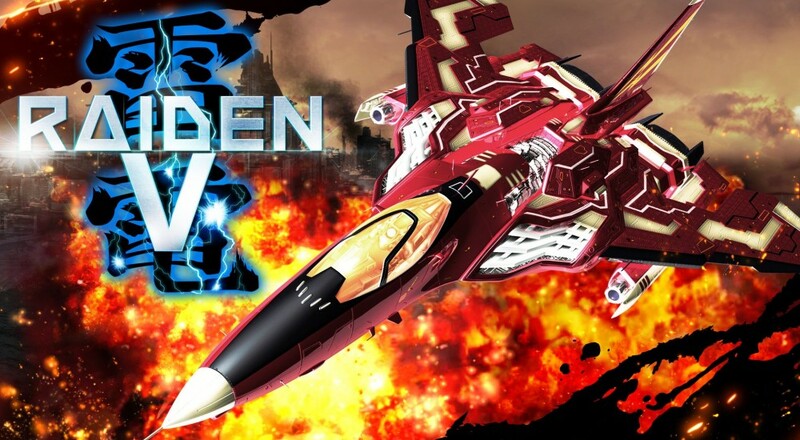 So buyer beware - Raiden V of Xbox One is not a cooperative game like its predecessors. And at $50 it's asking for quite the investment for what it offers. Page created in 0.6547 seconds.